While he deems that it is “normal” for the media to keep on pressing him for comments regarding his ex-girlfriend Cristine Reyes’s short-lived romance with Derek Ramsay, Rayver Cruz would rather not get involved in the already controversial breakup. “Actually kasi, sa totoo lang, sa mga issues na lumalabas, ayoko na talaga mag-comment,” he said in an interview during the press conference for the 9th Cinema One Originals film festival on Tuesday where he will be in the Ian Lorenos film Saturday Night Chills. But, Rayver nevertheless defended Cristine, who has been labeled a “playgirl” after her less-then-a-month relationship with Derek ended. “Hindi naman siya ganon… Mabait na tao si Cristine,” he said. Now that they are both single again, is there no chance for them to rekindle their romance? “Friends na lang muna talaga,” he supplied. Rayver was last linked to Binibing Pilipinas 2013 semi-finalist Imee Schweighart after photos of them together made rounds online some months ago. But Rayver quickly doused the rumor by saying that they are just friends and underscoring that if he’s seeing someone new, the public would be the first to know. 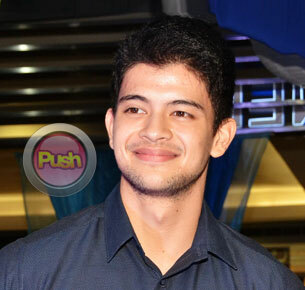 Meanwhile, Rayver was in high spirits about the upcoming Hollywood remake of his highly-acclaimed film On The Job with Gerald Anderson, Joel Torre, and Piolo Pascual. “Ang saya to be a part of that movie. Habang buhay ko itong tatandaan,” he said. According to Variety Magazine, Universal Pictures has optioned the rights to Erik Matti’s acclaimed crime drama with the remake said to be written, directed, and produced by Icelandic filmmaker Baltasar Kormakur and co-produced by Scott Stuber. Baltasar has been known in the industry for adapting previously written or filmed material in Hollywood. Among his biggest hits are are 2012’s Contraband, a remake of the Icelandic film Reykjavík-Rotterdam, which he himself had starred in, and the recently shown 2 Guns based on the graphic novel series of the same name.